There are more than 3,000 mosquito species in the world. Today, we'll look at five different species and explore their details up close. Mosquitoes are almost everywhere we look. Some species are harmless, while others are capable of spreading deadly diseases. Understanding the individual species is key to eliminating them from our populated areas. So, without further ado, let's find out about them. The house mosquito is formally known as the Culex pipiens. As its name suggests, it is the most common type of mosquito we see or hear in our homes. The average adult female usually lives up to 15 days, and they utilize this time well. The Culex pipiens larvae develop in water, whether it is the pond down the street or the old tire that collected rain in your backyard. This mosquito finds any wet place to be the perfect hatching nest for its offspring. This even includes polluted water or sewers. As soon as the adult mosquito emerges from its pupa, it is off to mate and feed on blood. Unfortunately for you, mosquitoes don't die after they've left their mark, unlike bees. As benign as the common house mosquito may sound, we often underestimate its abilities. The Culex pipiens mosquitoes are actually common carriers of the West Nile virus, as well as encephalitis. Both of these are deadly diseases. These mosquitoes often transfer diseases from birds to humans. They are opportunistic feeders, which means that they feed on anything. Like many other species, the house mosquito is nocturnal, meaning it will hunt during the night time. The female can be quite aggressive, since her short lifespan requires her to quickly collect enough blood to produce eggs. Unfortunately, for us, this means a night full of buzzing and stinging. The marsh mosquito, also known as the black salt marsh mosquito, or Aedes taeniorhynchus, is very common near coastal areas. This type does not pose as big a threat as the house mosquito above. However, it can still be rather aggressive. The marsh mosquitoes don't lay their eggs directly into the water. Instead, they prefer moist soil that is generally located near sheltered areas. They are able to spot places where the ground will be flooded when the eggs are ready to hatch. As the marsh mosquito larvae surface, they seek shelter in any type of water, be it salt or fresh. Here, they will take 5–15 days to develop into pupae. The pupae stage only lasts a couple of days before they are ready to enter the world as adults. You can tell the male and female apart by looking at their antennae. Females generally have only a few hair strands whereas the male antennae are full of them. Both male and female marsh mosquitoes are a brown color. Most also have white stripes near their legs, mouth, and feeding tube. Although these are not the primary transmitters of harmful diseases, they have been known to spread two diseases to humans. These are eastern equine encephalitis (EEE) and Venezuelan equine encephalitis (VEE). Marsh mosquitoes are excellent flyers. They can travel inland from the coastal marshes where they reproduce, in order to find and to feed on humans. They are typically found in Florida, where pest control specialists are working to eliminate any possible breeding spots. Fortunately, this mosquito very rarely lays her eggs near houses. As opposed to the house mosquito above, the marsh mosquitoes do not consider old tires or tin cans appropriate for hatching eggs. Experts recommend staying protected by wearing repellents to avoid them, and putting screens on your windows and doors at home. Asian tiger mosquitoes, also sometimes called forest mosquitoes, stem from southeast Asia. This mosquito species is known to transmit diseases such as the Zika virus, West Nile Virus, dengue fever, and Chikungunya. The Asian tiger mosquito has a unique look. It has a black base color, with white or silvery stripes running down its back and out toward its head. Smaller white bands surround parts of its limbs and body. Males have more feathery antennae than the females. The female is generally larger than her counterparts, growing up to 0.4 inches. She will use her antennae to detect possible blood meals. The Asian tiger mosquito larvae can also feed on other mosquito larvae. Since they are generally larger, the other larvae make an easy meal under the surface of the water. The adult females will lay their eggs in pretty much any standing water. People have spotted them in flower pots, birdbaths, and even swimming pools. All they require is half an inch of water. Since Asian tiger mosquitoes can spread numerous diseases, it's essential to report infestations, if you recognize their distinctive patterns. They tend to feed during the day, as opposed to their nocturnal cousins, which also makes them easier to spot. Over the decades, this species has migrated from Asia to the southern states of the U.S. They prefer warmer climates where they can actually survive mild winters. However, some do still appear further north. 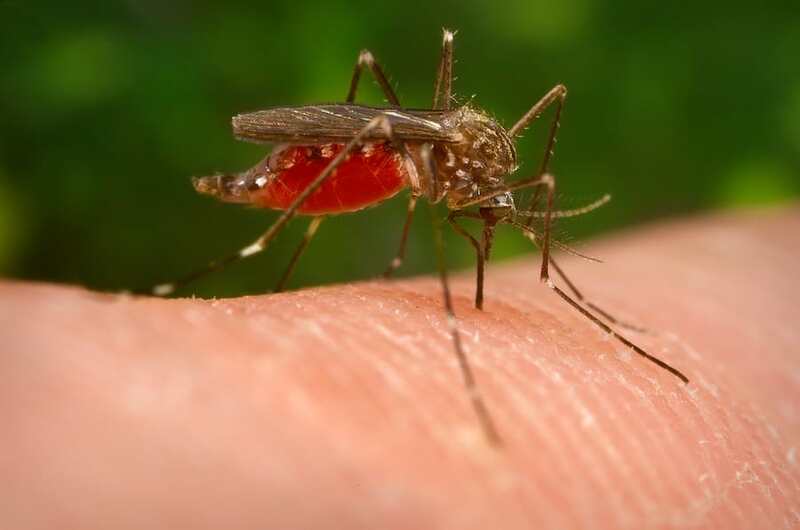 The yellow fever mosquito is well known as the Aedes aegypti, and carries diseases such as yellow fever, chikungunya, dengue fever, and malaria. Originating in Africa, it has since made its way across the ocean to the U.S. In some ways it resembles the Asian tiger mosquito with white stripes across its body and head, and down the legs. The main difference is its smaller size, up to a quarter of an inch. The females usually have white or silver scales across their belly, with little hairs on their antennae. They will lay their eggs in moist settings that may get flooded. The yellow fever female won't lay eggs in rafts (a collection of eggs) but instead, she puts her eggs down individually. These eggs can be tricky to get rid of. They are able to survive during dry weather for months and, once water touches them, they will hatch. During their larval stage, they can transform into pupae within a couple of days. If the weather seems too cold, they will remain as larvae until it warms up again, even if this takes months. Some countries consider this mosquito a significant health hazard, mainly due to its transmission of yellow fever. Fortunately, the U.S. has eliminated this threat with the help of vaccines and pest control. During the 1900s, pest control specialists began spreading insecticides within standing waters, in the hope of eradicating the Aedes aegypti. Unfortunately, once they stopped, the mosquito population increased yet again. Therefore, if you live in, or travel to, an area where yellow fever mosquitoes are known to be, it is essential to apply insect repellent. The southern mosquito will feed on humans anywhere, from America to Australia, Asia to Africa. They are even found in the Middle East and New Zealand. Within the U.S., we generally spot the southern mosquito around the states of Virginia, southern California and Iowa. These mosquitoes are relatively small, where the largest is less than 0.2 inches long. They are brown in color with short antennae. Across their bodies, scales and narrow bands form half-moon shapes. In contrast to the yellow fever mosquito above, the southern mosquito will lay her eggs in rafts, consisting of 100 to 200 eggs each. This species will leave her offspring to hatch in pretty much any still water. However, these eggs are not as hardy as those of the yellow fever mosquito. If the eggs are not in contact with water, they will die before evolving. The female southern mosquito, like her male counterpart, will feed on sugar, such as nectar from flowers. When she's pregnant, she will fly out to find a blood meal to develop her eggs. She is an opportunistic feeder, meaning any living creature with blood in its veins will do. As she goes out for her nightly feast after the sun has set, her primary choice is birds. On occasion, she will feed on the unfortunate human who crosses her path. Because this mosquito feeds on birds, she has become a transmitter of not only West Nile virus, but also St. Louis encephalitis. These diseases generally affect children and the elderly, two vulnerable groups. Experts stress the need for personal protection as well as reduction of habitats. This mosquito species often relies on humans to build its hatching spots, so removing containers that can collect water is crucial.